Astrid Jaekels public art can be found scattered throughout Edinburgh, her most recent being the 5 murals on the meadows. 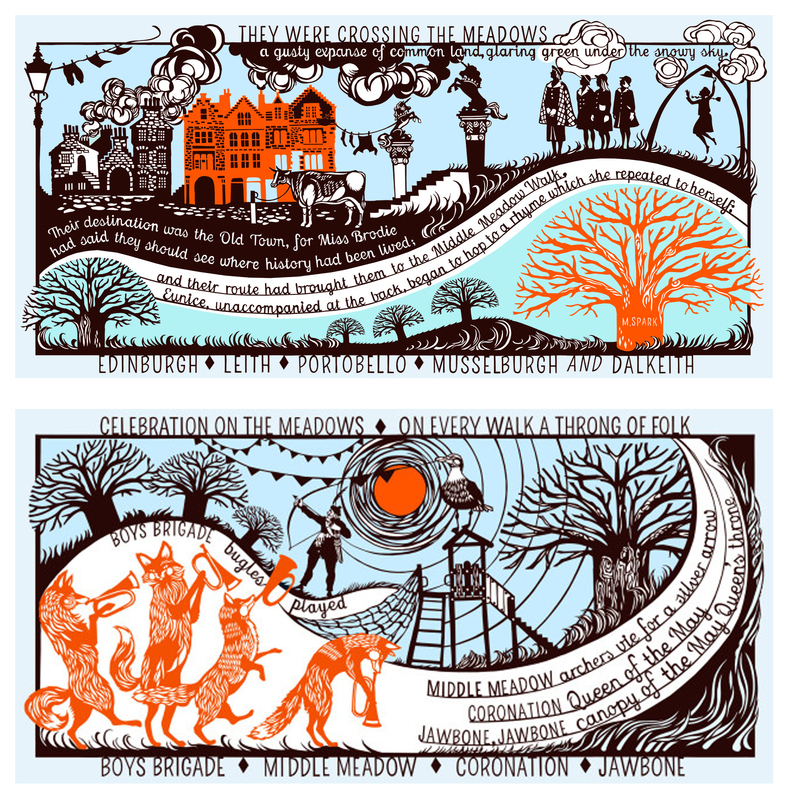 With these pieces she transformed a tired, graffitied wall into interesting and eye- catching pieces of art.Taking inspiration from the history of the meadows Astrid collaborated with the poet Rachel Woolf to create these murals which reflect on the folklore of the time. The 5 illustrated murals work all together as a collection but are also very strong when viewed individually. Each mural makes use of organic flowing lines and art- nouveau like shapes. It is clear that paper cutting is the primary technique used for these murals. As a result the shapes and lines are clean and strong and the negatives spaces are very important in creating detail. Text and typography also plays an important part in each illustration. The path names and titles of the panels are written in the frames of each mural, separate from the illustrations. Whereas the words of the poem are intertwined with the characters in the designs but are still clear to read. A limited palette of fresh colours is used in interesting combinations, varying on each mural. The backgrounds are all a light blue, like that seen on a hazy spring day in Edinburgh. On top of the blue each mural has one or two spot colours on certain characters or aspects the artist wished to emphasize. A dark brown is used for many of the illustrations and all the text. I like the use of a brown rather than black as it makes the lines less harsh and gives the pieces a more natural feel. The white spaces play an important part in these murals as they provide calm block shapes within the busy line work and bright colours. I find the dimensions of the murals very appealing, as they are large enough to get passer- bys attention but at the same time are not too big that they look out of place. The long landscape canvas allows the story to flow from left to right smoothly. This makes the murals very easy to read as your eye follows the illustrations and words across the space. The animated characters and descriptive poem make the narrative very apparent in the murals. I am very fond of Astrid Jaekels’ murals on the meadows and enjoy spotting something new every time I pass them. I think that these murals would appeal to a wide range of the public: children would be engaged with the friendly characters and bright colours, whilst adults can appreciate them as works of art and be intrigued by the history present in each piece. This public art has brightened middle Meadow walk and transformed a boring grey wall into engaging story- telling canvas. Thank you so much: this is brilliant!